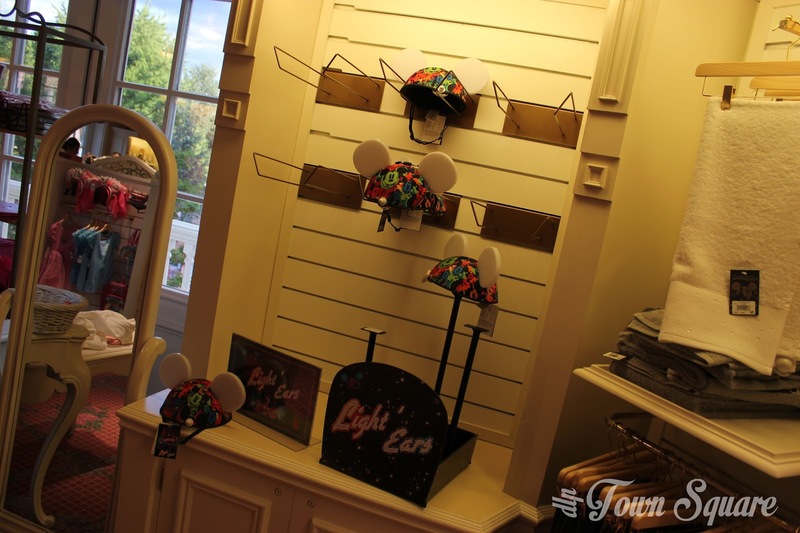 Despite Disneyland Paris fans talking about Light’Ears for about a year, it takes a bit more work for the general public and Disneyland Paris guests to understand the concept of the product they are being asked to buy. Add to that the European guests buying habits and perhaps you have a recipe for disaster? We already know that in the past Disney have got it very wrong with the European consumers, the way we consume and buy is quite different to that of the American market. Happily, Disney have learnt from mistakes made at Euro Disneyland and moved on to create a Hong Kong Disneyland that takes into account the cultural habits of the people of Hong Kong, and indeed they will be certain to do the same in Shanghai for the upcoming Shanghai Disney Resort, in this regard, Disneyland Paris’s original failures have improved the future for all resorts. The perfect example of getting European consumers wrong was the original policy of having no alcohol in the park (thus matching the parks American cousins), Europeans did not agree to this policy as alcohol is a larger part of European culture and so Euro Disney management reversed the decision and alcohol was served in Disneyland Paris. Having said that, there is no real evidence that Light’Ears would be a failure in Disneyland Paris, and in our opinion they are not a failure; however there is no real success story either. We’ve taken thoughts from you, our readers, and taken our own observations to analyse Light’Ears in Europe (and to some extent Glow with the Show in Disneyland Resort in California). in Disney Village and Disneyland Park to study the marketing and it really was shoddy. Essentially what we are told in the shop displays are that these are Light’Ears and that they are €20. Nothing more. Which, as a Disney fan is quite disappointing; we’ve all seen the press event videos presented to us by various Disney fansites, and Disneyland Paris themselves and have seen them as an amazing piece of technology that really could change the way we view Disney Dreams! forever. However, that potential will not be realised due to, in part, Disneyland Paris not telling guests what they do.On the face of it, during the daytime, these ears are a garish colour bonnet with white ears. It is only at night where these lights come into a life of their own. The problem is, Disneyland Paris have not advertised this during the daytime hours. 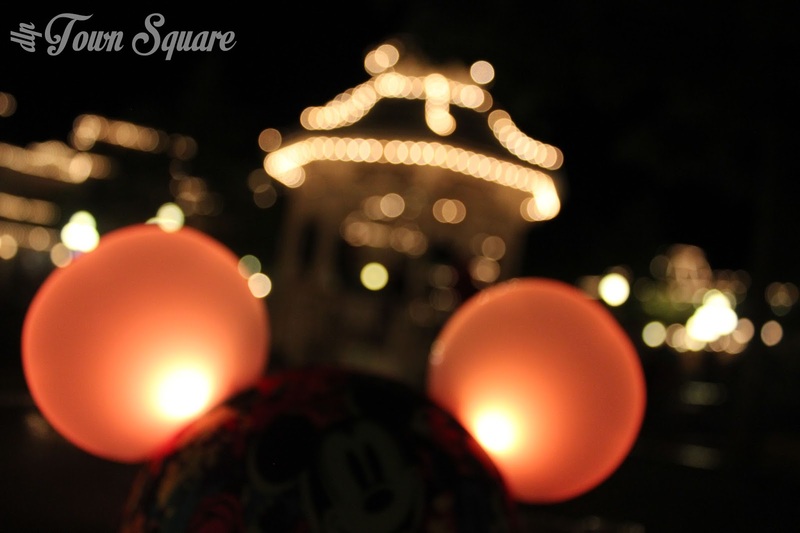 The image above is the only image in the entire resort of hat Light’Ears actually do, a small static image placed high up and slightly obscured. If anyone is likely to purchase these ears, it will be guests in hotels staying multiple nights. We took a walk through the Disneyland Paris resort hotels to take a look at how they were being marketed to guests there. If anything, guests here will see them as an investment right? Regrettably, Disneyland Paris seems to not think that this captive audience are more likely to buy the ears than a day trip guest; aside from the occasional window display, the displays are the exact same as in Disney Village and Disneyland Park, equally as uninviting and nondescript.The only advantage to the hotels is that guests will have hopefully seen them in action and have been convinced enough by them to actually purchase a pair. Our first visit to Disneyland Paris was in 1999, since then we’ve remembered the outdoor summer sellers of various light up merchandise. 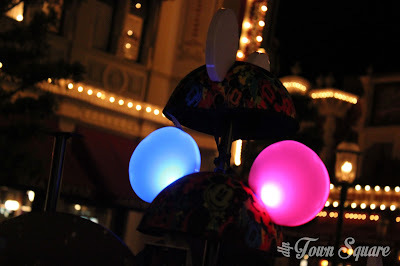 From the light spinners to the hair band ear hats, this sales tactic has clearly proven popular with Disney Parks customers as often hundreds of these light up merchandise can be seen upon exiting the park, mostly due to children falling in love with the merchandise and wanting it. 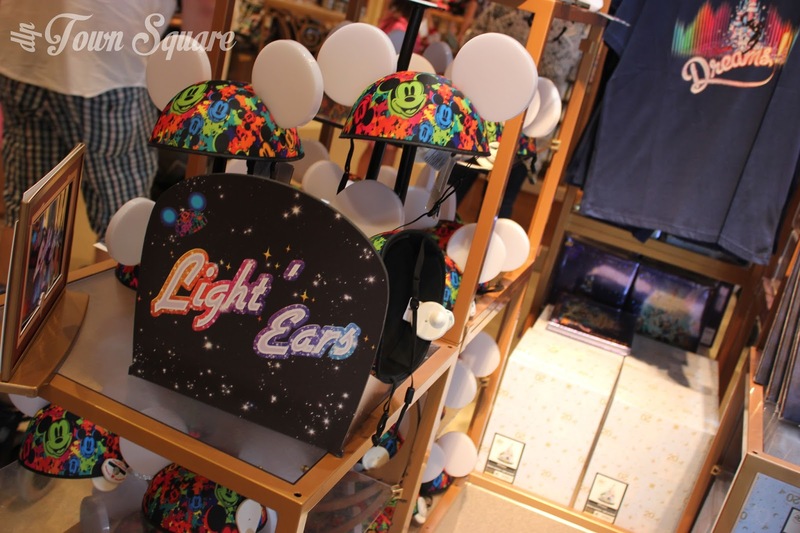 It is therefore no surprise that this tactic has been deployed to sell the Disney Light’Ears. 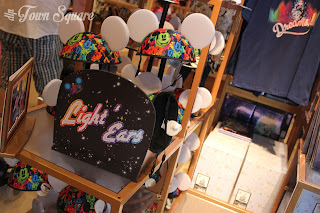 We saw the old Emporium outdoor sales units being used as well as the pin trading bike to bring Light’Ears up and down Main Street U.S.A.
From what we saw, guest were interested in the ears; every time we moved nearby a mobile unit there were a good number of guests taking a look, trying them on and perhaps even purchasing them. There is a certain charm about Light’Ears at night, the colours are vibrant and as more people bought them, others wanted to join in. We were asked a few times where we bought the ears from, this was certainly encouraging. The Disney Store in Europe are selling these ears for £18 (UK) €20 (FR), with a personalization option. If the marketing was good enough, people could be tempted to buy them before their holiday and thus not add to the increasingly important holiday budget. It’s a small psychological step, that could allow for major gains. The personalization, despite its price could be a big draw for some as they become a much more personal buy, however we have no idea how Disney Store’s personalization options sell, at the price (£4.95), we imagine that most won’t bother with it. We searched Light’Ear on both UK and France stores, the UK recognised the search term and displayed the item we wanted, the French store, however, did not recognise Light’Ear, instead only showing when I searched ‘Oreille’. Not really ideal given the in park publicity calls them Light’Ears if Disney fans can’t find them by searching their actual name. 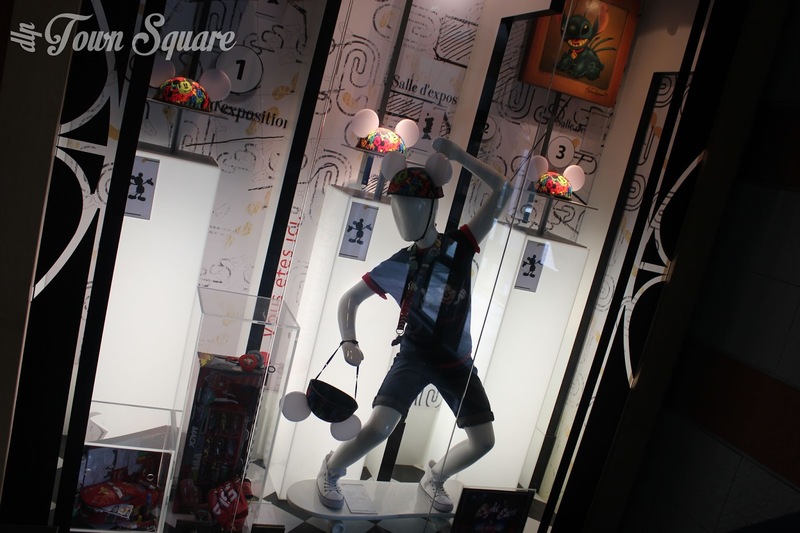 Perhaps the most important point to mention here is Disney Store’s facebook publicity, which finally explicitly mentions the fact that they light up to the Disney Dreams! Show and even contains the promo images that we all marvelled at in April. Finally, park literature does advertise these ears, but only in a minimalistic way. For example your weekly programme (Times guide for our American friends) has a small advertisement at the top of the page. The advert certainly is attention grabbing, and is very clear as to what they actually do. Perhaps the best advertisement in the resort for the product but we have an issue at Disneyland Paris where not nearly as many people pick up the programme than the map. The map however advertises them in a much more minimal way, a small text advert (much like the one above) on the rear of the map (the tips for the day, which everybody generally ignores), and a small icon on the 20th anniversary specials on the park map. However, I do agree that marketing on the map really is a difficult one. I think it’s been managed in the best possible way, a map is a functional item; not so much to set up a purchase. When night falls, CMs do their best to sell the ears. 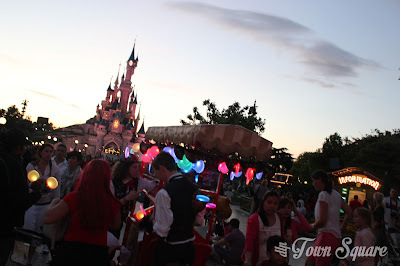 @manicSara mentioned that she doesn’t go to Disneyland Paris often enough to see it as a worthwhile investment. Which we understand, if you were only visiting Disneyland Paris on a day trip, there are so many better things to spend money on, perhaps if you were having a 3,4 or 5 night stay, the price per show drops. Local residents will get the best value from these ears. @imaginat1on told us that he wouldn’t even be bringing the pair he was given at Disneyland Resort for the World of Color show, again we understand this point of view. These are a pain to travel with, some people just don’t like them and if you aren’t staying at an on site hotel you have to carry them around all day, and no, they do not easily fold down. He told us that the DLR take up was extremely slow. @DLRPRoundup was more positive telling us that he believes potential exists for them to be expanded even further (such as at Disneyland Resort), they could be synchronised with shows, attractions and more. We agree, this could be the start of a really exciting development and would really help boost take-up! Otherwise, these ears are essentially good for 23 minutes. @Seiter_Klaudia mentioned the steep price mark. €20 doesn’t sound a lot of money, but as soon as you think about a family of 4 or 5 people, those €20 very quickly begin to add up and become quite unsupportable. A one-off €20 is a lot anyway, but as soon as you hit that €100, that is a massive turn off. We thank our twitter followers for their thoughts. In the park we noticed a few things, people wanted to buy Light’Ears, we were asked where we got them, others looked at the ears during the show and were enchanted by what they saw. We saw a few guests looking at buying them as they left the park, perhaps to return with them another day? One of our stranger observations was at the start of the show, as the earmitters begin to transmit and Main Street USA is plunged into darkness, the ears actually turn off for a few seconds. This caused a couple of guests near us to take them off their head, thought that perhaps they had been deactivated and take them off for the duration of the show. However, to say Light’Ears don’t sell is a lie. Take here at the Disneyland Hotel for example. European and American Disney Parks guests are different. Generally speaking, Disneyland Paris does a great job in recognising this and acting upon it. 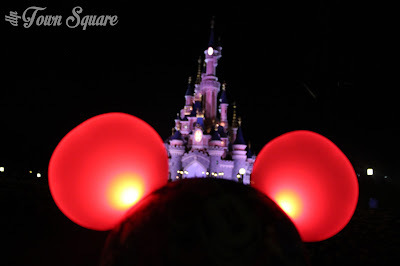 Mickey Mouse ears have never taken off in our European park in the way that they have over at Disneyland or Walt Disney World, does that mean that Light’Ears (which essentially are a very similar product) won’t sell? Not at all, if we’ve learnt one thing, it is that novelty hats sell. Countless hundreds of guests each day visit the stores and buy those big blue sorcerer Mickey hats, thousands more take photos of themselves wearing the hats. So hats sell, and light up merchandise sells. So would a combination of the two sell? Logic would say yes, but European consumers are not especially ‘logical’ in this sense. European consumers are quite calculating and rarely buy something without thinking. A €20 hat for a 20 minute show, whereas this sorcerer mickey hat is €21 and can be worn all day; Sorcerer Mickey hat wins every time. 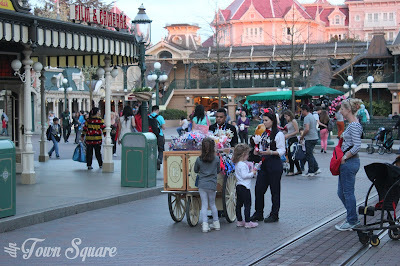 Add onto this that perhaps consumers do not know what the hats actually do, perhaps they are seen as obtrusive (as Disneyland Paris fan and guest @Timekeeper mentioned, a guest asked him to take off his ears as they couldn’t see). European guests need to be educated and persuaded. A price decrease would certainly persuade more Europeans to take the plunge. Despite this article generally criticising Light’Ears and the marketing of them, we are actually very favourable of the product, in fact we gave them five stars. We believe the potential exists for these Light’Ears to be a huge success, the aim of this article was to point our flaws and to hopefully allow those to be improved. However, we have thought up some suggestions of our own that we would like to see implemented. Our first idea is to give hotel guests a pair. Using the logic of ‘success breeds success’ we think that more Light’Ears on central plaza would actually sell more Light’Ears. Now, this doesn’t have to be a something for nothing type idea. Perhaps raising package prices by a very tiny sum would cover the cost of this. People plan a finite sum of spending money for their trips, especially in the current tough economic climate. Perhaps by including them in the price of the holiday you’ll very sneakily get round this. The more Light’Ears people see in Main Street USA, the more they are likely to think that buying a pair would be beneficial. And besides, checking into the hotel and having a little gift on the bed could make people come back. It’s the little things that make the Disney difference. A reserved area for viewing the show for Light’Ear owners. Another way of making people believe that there are more Light’Ears than there actually are is to group them all together. Not only that, but the promise of a good spot AND a near guaranteed view of other Light’Ears might persuade a purchase. At the moment the potentiality exists that guests will buy a pair and not see the benefit. As more and more people come back with their ears, the reserved area could be expanded initially before finally being retired as hopefully enough people will be on Main Street each day with their ears. We heard the rumour was that a plan to have an area like that was envisaged, we’d love to see it come to fruition. 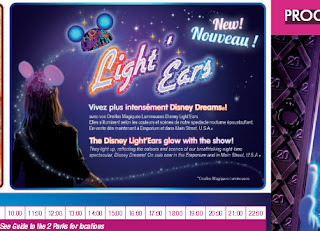 Using Light’Ears to synchronise up to Disney’s Fantilusion parade would be perfect. First of all, you have a clear parade route to move up and down Main Street USA to sell the ears, rather than the busy street where the sellers can’t access the people nearest the castle, secondly the ears synchronising with the parade would be that perfect advertisement for more Light’Ears to be sold for Disney Dreams! They look amazing at night. The colours are vibrant. 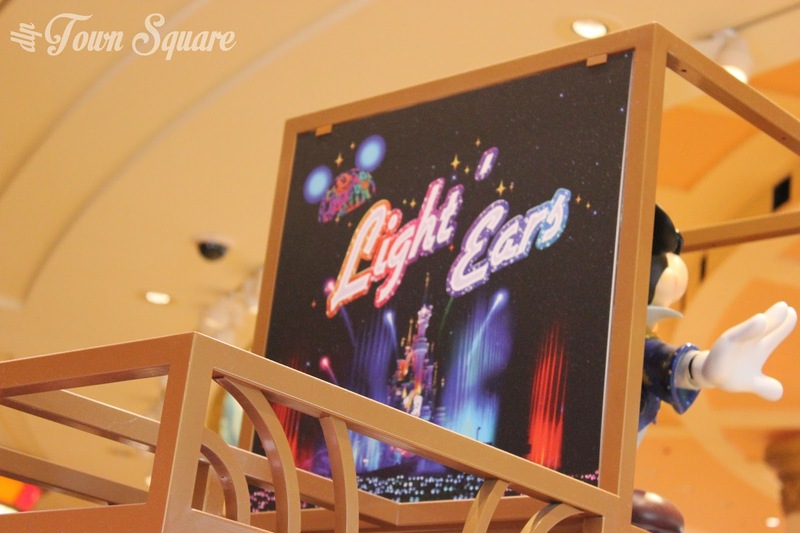 A big critique I have of Light’Ears at the moment is the poor marketing in the Disneyland Paris stores, a video advertising screen at each Light’Ear point of sale would make for an interactive sales experience with a clear illustration of what the ears actually do. We feel that this would improve sales as they will no longer be seen as ‘just a mickey hat with lights’. We recently heard from our friends at DLRP Express that Disneyland Paris have added announcements at 15 minutes before the show advising guests that it is time to turn on their Light’Ears and prepare to synchronise with the show, thus doing two things. 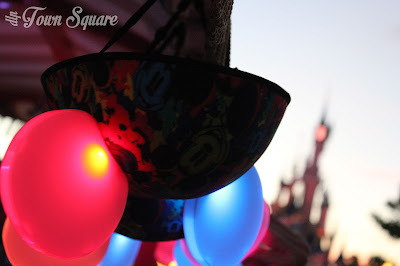 Advising guests that have already purchased the ears that there really is more than meets the eye to the hats, and advising those who have not got a pair that these aren’t going to irritate you during the show; in fact they are going to enhance your show. Now, we believe that this announcement comes to late. In the summer with 15 minutes to go, you are in your place and you won’t move to buy a pair of ears. (We realise this isn’t a sales announcement), however this announcement perhaps 15 minutes earlier could facilitate more purchases without even changing the announcement wording, in a way this is very sly advertising. Advertising with blatantly advertising. Finally, we know our friend @plazagardens would like to see a sort of offer system. Be it a buy one get one free offer, or buy 3 pairs and get the 4th free or even half price ears through a receipt at a Disneyland Paris restaurant (such as the free drink offer). We hope this article has outlined some of our concerns about Light’Ears in a constructive manner, and also provided plenty of positive points. Once again, we are very positive about Light’Ears here and their future direction (as shown by our eagerness to get a pair! ), but we feel that there really is work to be done and that Disneyland Paris, should and can easily commit themselves to this products long term future, of which we have not doubt that there will be one. DLP Town Square tried out Light’Ears in August 2013, and gave them five stars in our recent review. Once again, this wasn’t an article to criticise Disneyland Paris, more to point out flaws in the hope of improving the future. PreviousPrevious post:Light’Ears, our thoughts and a pleaNextNext post:Frozen Disney Dreams! coming this winter. Thanks for your comment! We annual pass holders get our respective discounts, for me 20%. However I think an event like that in California where AP holders got them free would have been a good idea. 2 weeks ago I spotted perhaps a hundred ears, still not a great turn out. I hope DLP considers at least one of the ideas here (perhaps they already have and are waiting to roll it out?). They are a fantastic bit of technology and I’d love to see it realise it’s potential.